1. Take a dip in a pool, or take a trip to the lake, river or anywhere you can find some water to cool off in. 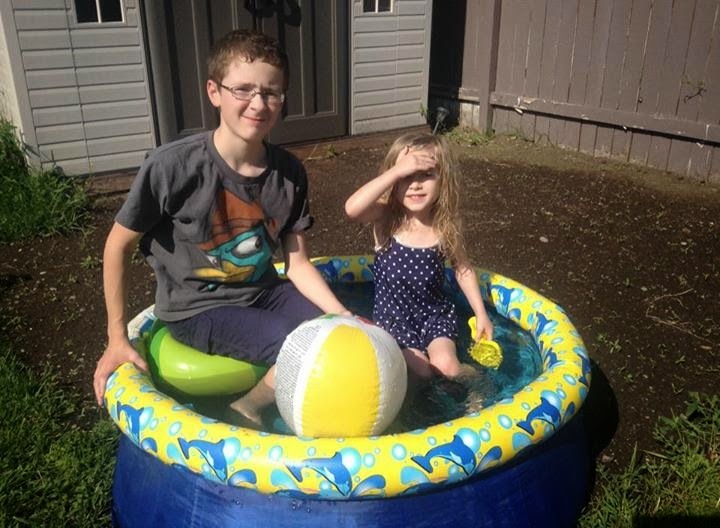 Evidently, the kids pool is getting a little small for both of them to sit in. This was a purchase from the days when prior to moving in we didn't have our own yard so it had to fit on a balcony. I even used this a few times this week to stick my feet in to cool off. 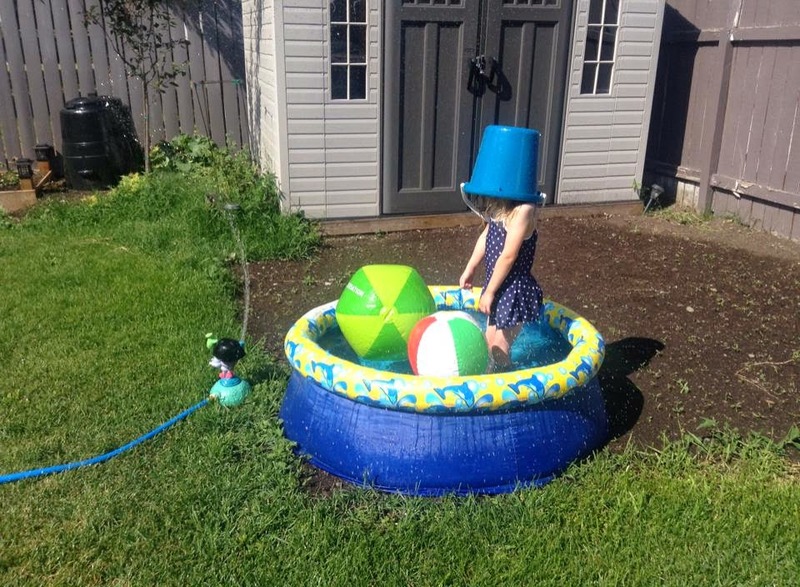 Add in a sprinkler and you get even more cooling, however for some it might be too much so thankfully she had a bucket nearby to shield herself from the spray. 2. Speaking of water it is of course important to ensure that you stay hydrated. One of the best ways is of course to drink water and lots of it. Drinks with caffeine and alcohol should be avoided as they can make the heats effects on you worse. Beer will actually dehydrate your body so should not be consumed. Not drinking alcohol at all myself that is a pretty easy one to avoid. 3. 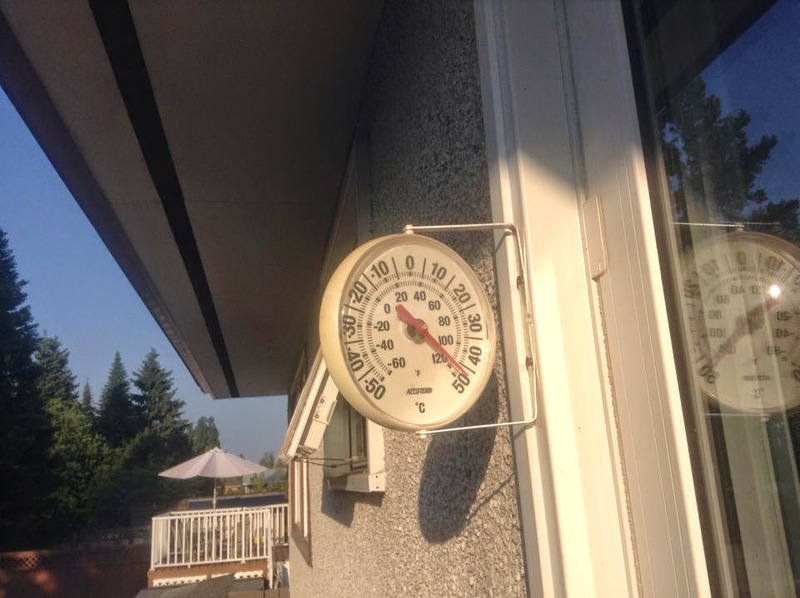 Avoid strenuous activity during the hottest times of day. This is why you would have found me loading yard waste in the van at 9:30 at night the other day, dropping it off at 8:00 am and vacuuming out the van at 10:30 last night to clean it up. This is also why I have been retreating to the basement to tidy up the storage room so that I can still get something done during the day besides playing games on my computer or reading. The dishes piling up on the counter will just have to wait as the kitchen is of course one of the hottest places right now! 4. Speaking of the kitchen, stay out of it! No baking or cooking if you can help it. Normally I would be making some muffins for our camping trip but will be buying them instead since it is too hot. I cooked dinner on the bbq last night and eating hot food was still too much for us. So tonight I had a nice salad and everyone else had sandwiches. 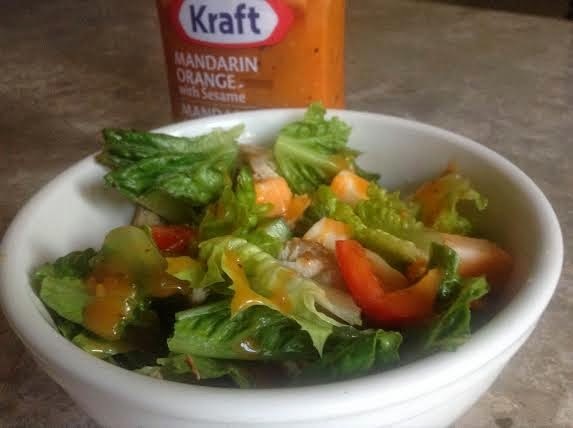 This dressing is a staple in our house and the kids favorite. It went perfectly with my salad with a bit of leftover bbq chicken from last night. 5. Speaking of food, (have I mentioned how much I love food!) it can be a great way to stay hydrated too. 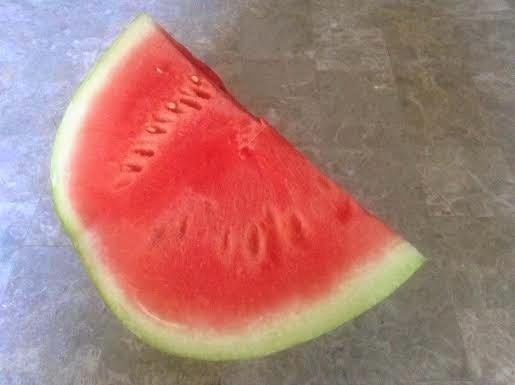 We have devoured a large watermelon in the past two days. Eating fruits (and veggies) with high water content is a great choice during hot weather. Plus fit makes for a great light lunch or snack paired with something like crackers and cheese. Watermelon, corn on the cob, leafy lettuces and cucumbers are all great choices! 6. Put your freezer to work. Popsicle and freezies are great, and you can even make your own with fresh pureed fruit or juice. We also like to freeze yogurt tubes for nice cold snacks. Frozen fruit like berries would be great too either on it's own or to make smoothies! 7. Wear minimal clothing, shorts and tank tops are a must! And if you stay inside you can even wear less, for women shorts and sports bras are great and men can simply wear shorts and skip wearing a shirt. Or if you don't have kids running around in your underwear would be fine. 8. This one is a favorite of the kids but adults will be sure to want to join in during the hot weather. Break out the water guns and have an epic backyard battle to help cool off. We have been known to simply start spraying each other with the garden hose sprayer! If that is too much for you simply keeping a spray bottle of water by your side to mist yourself with can help. We have one of those neat battery operated fans that mists water that is great! 9. Some quick tips for a good nights sleep. Take a cool shower right before heading to bed to help lower body temperature enough to fall asleep. Ditch the blankets and simply sleep under a sheet. While I haven't tried it I also saw a neat tip to put your sheet in a plastic bag in the fridge for a couple hours before bed. Much as the cold shower lowers your body temperature, cold sheets should do the same to help you fall asleep better. 10. Go shopping. We did a bit of this today as there was some stuff we needed to grab for an upcoming camping trip. Walking around in those nice air-conditioned stores was SO NICE! Walking back out of course snapped us back to reality but it was nice to have a bit of relief. From the temperature at least, because of course like any typical preteen Nathan still complained about how long we had to go shopping for. 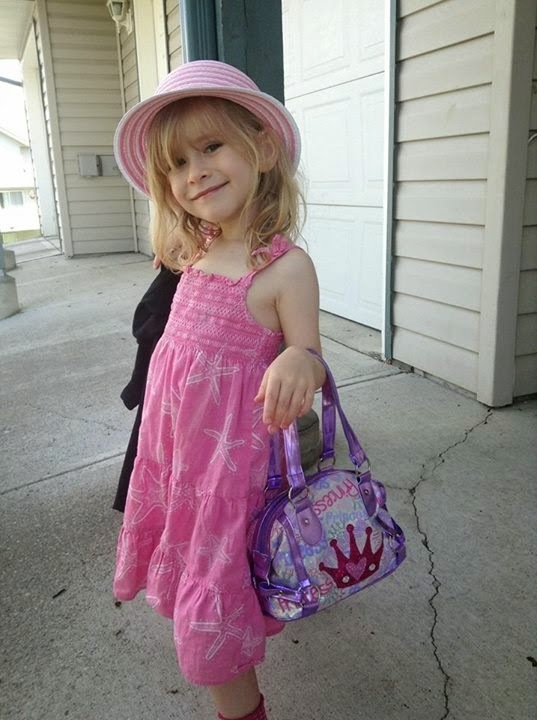 Karensa of course is a natural and loves any chance to go. What are your favorite ways to stay cool on a hot day?